Dead Air by Deborah Shlian and Linda Reid, a Mysterious Review. Review: Co-authors Deborah Shlian and Linda Reid introduce Sammy Greene, an investigative reporter and radio journalist for a prestigious New England college investigating the death of a professor and the suicides of a number of students, in Dead Air. A junior at Ellsford University in Vermont, Sammy is also employed by the campus radio station WELL. She'd rather be working on her next journalism assignment as a communications major than studying genetics, and towards that end she decides to follow up on an interview with Professor Burton Conrad, who recently received the Ellsford Award for Excellence in Teaching and told Sammy it was the "kiss of death". "Teaching is the mission of Ellsford University," he says, "[but] teaching is no longer a priority. No, what really counts here is something more quantitative." When Sammy arrives at Conrad's residence, she's shocked to find him dead. And supremely ironic, given what he had said to her just the day before. Her journalistic instinct tells her there's more to the story here, but she already has something else on her plate, reporting on a recent rash of student suicides. 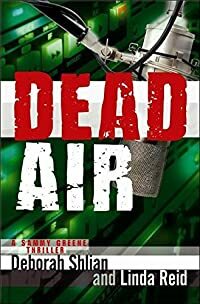 The problem here, and it's mostly stylistic, is that Dead Air seems to waver between a cozy and a thriller, not quite one or the other yet not altogether satisfactory either. The plot, set in 1995 for reasons that aren't entirely obvious, gives away too much too soon using an often choppy narrative, resulting in little suspense in terms of whodunit, whydunit, or even howdunit. And the denouement, with its complicated familial relationships and uncertain motives, is a bit of a disappointment. Still, given a more structured, uncluttered case for Sammy to investigate, the stage is set for a series that should have considerable appeal. Acknowledgment: Oceanview Publishing provided a copy of Dead Air for this review.